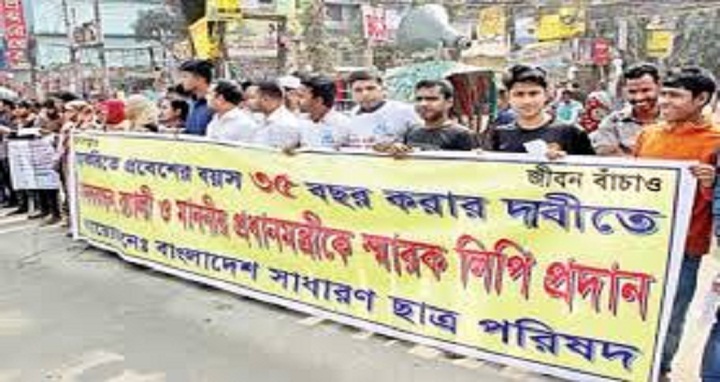 Dhaka, 2 September, Abnews: Bangladesh Sadharon Chhatra Parishad formed a human chain on Sunday demanding extension of the age limit for government jobs from 30 years to 35. The student organization came up with the demand during the programme in front of National Press Club in the capital. The government wants to raise age limit to 32/33 but we will not accept those. We want 35 years, students said. Sanjay Das, Harun-or-Rashid, Sabuj Bhuiyan, Kamrun Nahar Jhuma, Nipa and others spoke at the programme.